In many cultures, summer goes hand-in-hand with sitting around a roaring bonfire on the beach, spending time with your friends. Japan has upped the ante with its fire festivals, which are just as fun, and even better to enjoy with a crowd. Make time to check out these festivals when planning your summer itinerary! Held in Yamaga City in Kumamoto Prefecture (known as the “land of fire”), the Yamaga Lantern Festival (Yamaga Toro Matsuri) is considered one of the area’s most prominent summer events. The festival has legendary roots in a visit by Emperor Keiko (71-130), the 12th emperor of Japan, who was hindered by a dense fog that was then illuminated by pine torches held by the townsfolk, who guided him to his destination. The festival takes place on August 15 and 16, and is centered around Omiya Shrine and along the nearby Kikuchi River. The main event happens on the second night on the grounds of Yamaga Elementary School, where 1,000 women wearing ornate yukata with lighted gold and silver lanterns on their heads perform a Bon dance while chanting at a low tempo. Men reenact the welcoming of the emperor, lining up for the Pine Torch Procession in period attire. The closing ceremony sees lanterns offered to the gods at Omiya Shrine at midnight. The Yoshida Fire Festival, or Yoshida-no-Himatsuri, is a two-day event held on August 26 and 27 in Fujiyoshida City, Yamanashi Prefecture. For over 500 years the festival has been held to appease the goddess of Mount Fuji, Konohanasakuya-hime-no-mikoto, in order to keep volcanic eruptions at bay and celebrate the end of the climbing season. 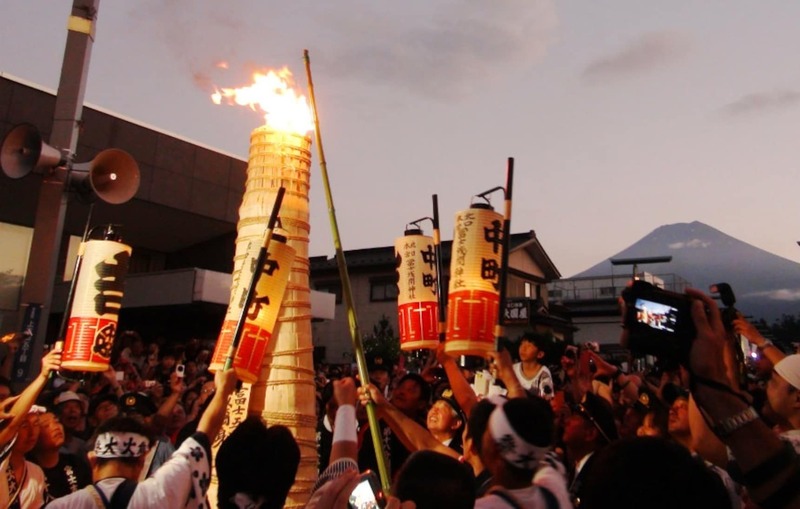 The event involves two large mikoshi paraded through the streets from Kitaguchi Hongu Fuji Sengen Shrine and back again, with 3-meter (9.8-ft) torches called taimatsu lining the streets as night falls on the first day. The Nachi-no-Ogi Matsuri, or Nachi Fire Festival, is one of the three largest fire festivals held in the country. The idyllic Kumano mountains of Wakayama Prefecture are a registered World Heritage Site, and it’s at the 133-meter (436-ft) Nachi Falls that the event takes place. The falls are worshiped in their own right, and there are a dozen 6-meter (40 ft) mikoshi, or portable shrines, created in its likeness. The mikoshi house nearby Nachi Taisha Grand Shrine's 12 deities, and are carried on men's shoulders to the foot of the falls to be purified by 12 enormous, 50-kilogram (110-lb) torches. The event takes place on July 14, and is quite popular, so it's best to arrive early to get a good view of the spiritual spectacle. Perhaps an event that needs no introduction, the Daimonji Gozan Okuribi, or Daimonji Bonfire, takes place yearly on August 16 on the slopes of the mountains in the Kyoto Basin, and is synonymous with Japanese summer. The fires are said to be lit for the safe return of the souls welcomed back during Obon, Japan's summertime festival of the dead. Droves of people visit Kyoto to see this event every year. The event kicks off with the lighting of the symbol for “large” (大, dai) on the side of Nyoi-ga-take, also referred to as Daimonji-yama. Four other massive fires are lit over the next 20 minutes in the surrounding hillsides, making for a brilliant spectacle that can be seen throughout the city.